Unlimited BlackBerry email for $10 on T-Mobile | BlackBerry Blast! T-Mobile is now offering a very attractive price for their new BlackBerry lineup. 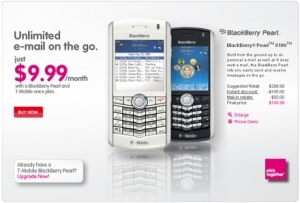 As the picture shows, you can get now get a BlackBerry Pearl in one of 5 colors and add an unlimited email plan for $9.99 per month. You'll still need to add on a voice plan but that is very inexpensive. The only downside we can see is T-Mobile still does no have 3G service. Sprint has had it for years. What's up?